It’s easier to say what Faith@Home isn’t than what it is. It’s not a program or a sermon series. Neither is it the latest church fad.In fact, the latest research offers a sobering reality regarding faith at home. Fewer than 10% of parents who regularly attend church with their kids read the Bible together, pray together (other than at meal times) or participate in an act of service as a family unit. 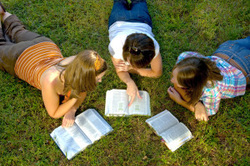 Only 28% of churched youth have talked with mum about faith. Only 13% of churched youth have talked with dad about faith. And finally, 69-94% of evangelical children are leaving the church shortly after they finish high school. How did it come to this? The Scriptures are clear that the home is the primary place where faith is nurtured and passed from generation to generation. (Deuteronomy 6:1-9, 2 Timothy 1:5). Could it be that the church has become such a trusted partner for “outsourcing” spiritual growth that a robust, Christ-centered spiritual life in the home seems somehow less important? The research above suggests that the answer just might be yes. So what do we do? Part of the solution involves us continually shaping our ministry so that it is increasingly home-centered and church-assisted instead of the more typical church-centered, home-assisted model. In short, that’s Faith@Home—an idea that helps us fully embrace this difference.